This lithograph is taken from plate 9 of Emily Eden's 'Portraits of the Princes and People of India'. The Raja of Patiala was the chief of the largest of the Sikh principalities on the south bank of the Sutlej and owed its allegiance to the British government. 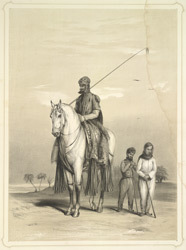 Eden wrote: "A Hindoostanee Horseman of the Sikh Rajah of Putteealla, on the British side of the Sutlej ... The Horseman was remarkable for an agility in feats of equestrianism which would have gained a fortune for him at Astley's. The Two Dwarfs are maintained by the Raja as a part of his state establishment, of curiosity, or diversion."